Stocks celebrated the one-year anniversary of the start of their greatest rally since FDR was president by posting modest gains Tuesday, albeit just barely. 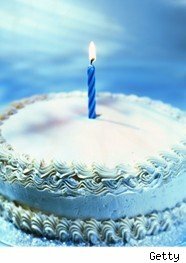 In a nice bit of irony, the telecommunications sector helped salvage a happy birthday for equities, boosted by the unveiling of Cisco's (CSCO) new superfast network router. Telecoms lead the S&P 500 ($INX) in Tuesday's session, but have been the biggest laggards by far throughout the rally. The blue-chip Dow Jones Industrial Average ($INDU) rose 12 points, or 0.1%, to finish at 10,564, while the broader S&P 500 added 2 points, or 0.2%, to 1,140. The tech-heavy Nasdaq Composite ($COMPX) gained 8 points, or 0.4%, to close at 2,341. "It's been a year that saw the S&P 500 have its best rally in 76 years, carried on the wings of low interest rates and more than $12 trillion of assorted stimulus efforts committed to by governments and central banks worldwide," wrote John Stoltzfus, market strategist at Ticonderoga Securities. "The economic data flow and the overall revenues and earnings improvements we've begun to see over the last two quarters points in the direction of a beginning of a return to normalcy." The S&P 500 had an epic rally over the last 52 weeks, climbing more than 68% from a 12-year low. The Dow is up more than 60% over that period, while the Nasdaq is up 85%. The financial sector, priced for Armageddon a year ago, led the broader market by gaining more than 150% over the last 12 months, according to Capital IQ. Other riskier, more economically sensitive sectors followed that lead, as consumer discretionary and industrial shares nearly doubled, while information technology and basic materials rose about 80% each. Naturally, the more defensive sectors lagged the broader market during the rally. Telecommunications were the biggest drag, rising less than 15%, while utilities gained 30%. Other laggards included consumer staples with a 40% gain and health care, which rose less than 45%. The second year of a rally almost always cools off dramatically from the first, and even the most optimistic view of equities concedes that the easy money in this bull market has been made. As bearish David Rosenberg, chief economist and strategist at Gluskin Sheff, reminded clients Tuesday, the past year was like nothing in recent memory. "It was not until September 2006, nearly four years into the last bull market, that the equity market managed to rise this far off the lows," Rosenberg wrote. "This time it has taken less than 12 months."